Ideal for first timers, families or those short of time. 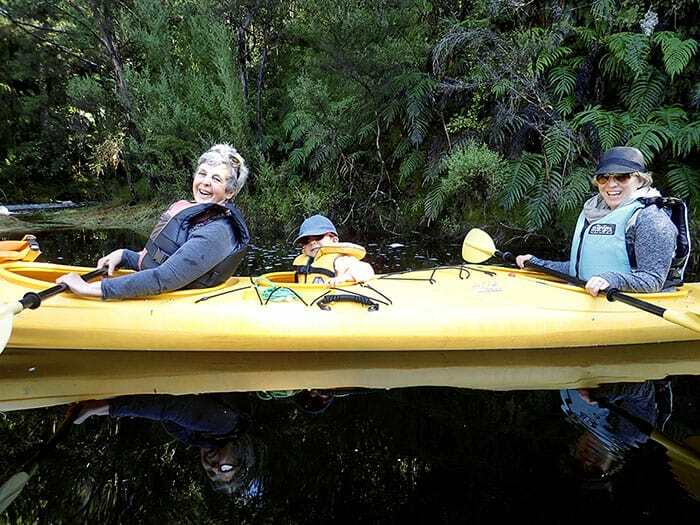 Our most popular kayak – allows you to explore deep into the waterways. Up to four hours on the water. Sit back and relax, fit it all in as well as an afternoon siesta! One child (below the age of 18) with a full paying adult is charged at half price. Contact us by phone or email to book. Minimum of two adults. One child (below the age of 18) with a full paying adult is charged at half price. Contact us by phone or email to book. 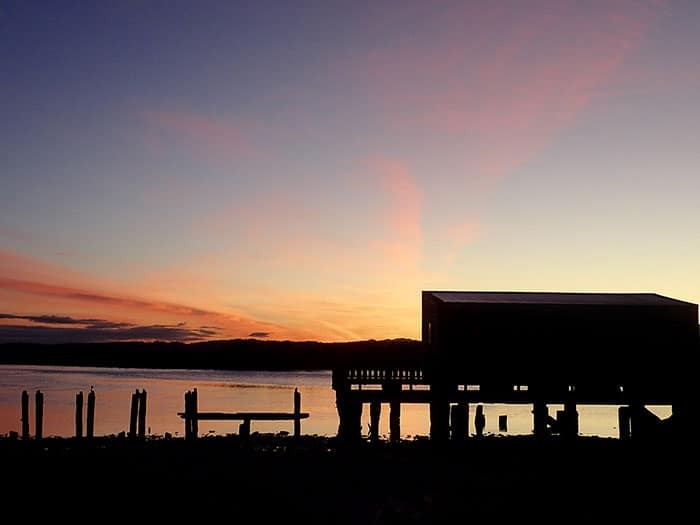 Bring your own camping gear to spend the night under the clear South Westland night skies, camping on the edge of the lagoon. 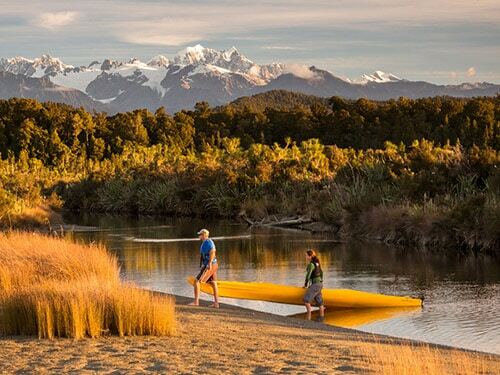 Enjoy fantastic sunset and sunrise views of the Southern Alps from the shores of the wild Tasman Sea, and maybe the call of the Okarito Brown Kiwi/Rowi. All our trips start with a full briefing on kayaking routes and options, tides and weather conditions, bird watching and kayak safety. Allow 45 minutes prior to getting on the water. Contact us for the latest check in time for your trip. Your safety is our priority! No. Many of our kayakers are first timers or have little experience. We will enquire about your swimming ability and will not put you out on the water if we consider the weather or water conditions to be unsuitable. We want you to enjoy your experience. A full safety and navigational briefing is given to all kayakers. Most of the lagoon (about 95%) is less than 1 metre deep. We also have a rescue boat on standby at all times. Give us a call or email us! We’re a small personal company and don’t do automated bookings as we want to tailor your kayak trip for you to get the best conditions and experience on the lagoon. So we’ll chat to you about your kayak experience, how long you want to go out for and work out the best time for you to kayak with the tides and weather on the day you want to go. Is there a minumum age? No. No maximum age either! We really like enabling families to get out and explore; in the right conditions the lagoon is a great place for kids to get up close and personal with nature safely. We’ll take a really careful look at weather, tidal conditions and the abilities of your family or group at the time, to ensure you are safe and comfortable out on the water. We have life jackets or buoyancy aids for all ages, and will discuss a safe route to follow. If the weather or conditions are not right for your group, we’ll say so, and might suggest a guided trip as an option, or tell you to try another day. Can I see White Heron/Kotuku? Hopefully! It’s rare to paddle out on the lagoon and not see these stunning and rare birds. We only have around 170 White Heron/Kotuku in NZ, and the only nesting site for the Kotuku in NZ is just north of the lagoon on the Waitangiroto river. Whilst you cannot access the nesting site by kayak, it’s common to see these graceful birds feeding throughout the lagoon, and in the tidal rivers that can only be accessed by kayak. 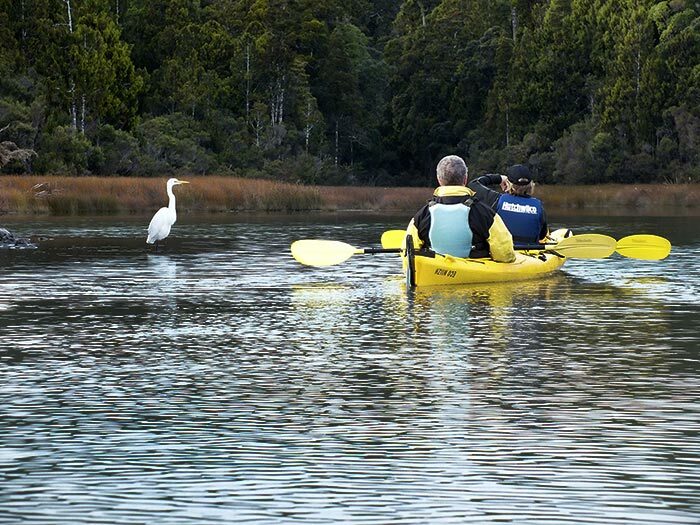 Kayaking allows you to drift peacefully past the Kotuku and many other wading birds at your own pace, without disturbing their feeding, and observe their behaviour from close up. What other birdlife might I see? Well, where do we start?! 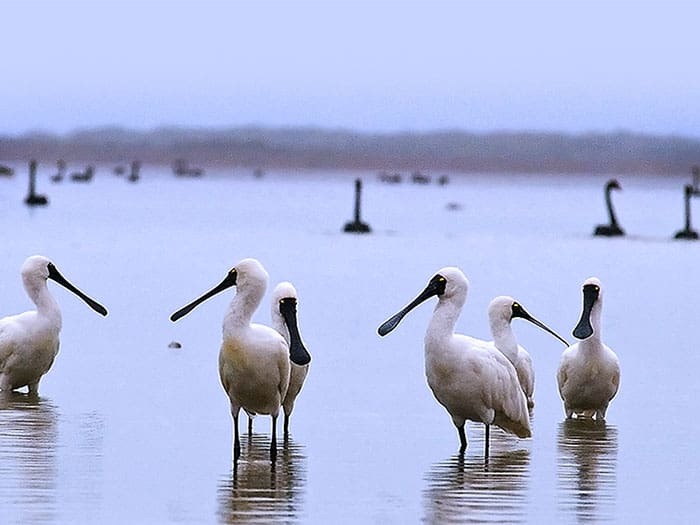 We are famed for the White Heron/Kotuku here in Okarito, but there are over seventy different recorded bird species that feed in and around the lagoon. 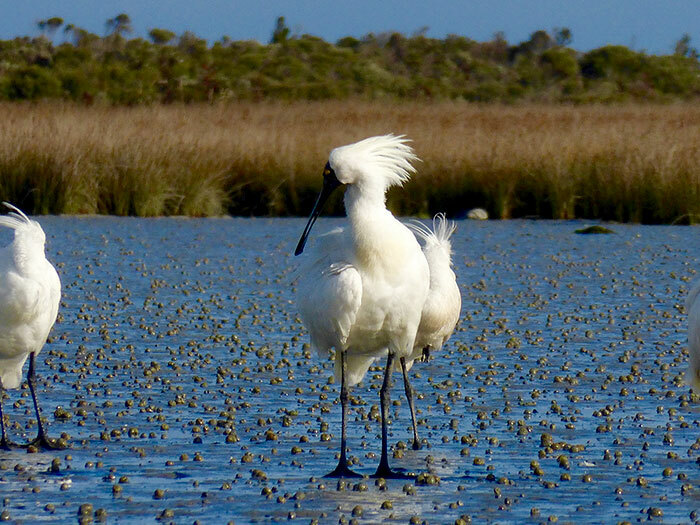 Wading birds include the comical looking Royal Spoonbill, head down, feeding like a over-caffeinated vacuum cleaner, and the shy White-Faced Heron, hiding in the rushes that gives our lagoon and town it’s name. Fernbirds hide in the saltmarsh, their strong metallic-sounding ‘chip’ carrying across the shallow channels accessible only by kayak on high tide. Oystercatchers distract themselves battling in a squawking contest on the mudflats whilst Pied Stilts and Banded Dotterels scurry in a hurry around them, to steal the wriggling worms they’ve forgotten about. We think Oystercatchers may have Avian Attention Deficient Disorder. Shags of various size and shape stretch out their long wings on forest debris scattered above the waterline in the lagoon; their effort to dry out their waterlogged bodies after a diving for food looks like a cross between a yoga pose and a Karate Kid impression. Spring sees the arrival of the Eastern Bar-Tailed Godwit, currently the NZ Bird of the Year (yes, we have one! ), here to feed and get plump again after it’s incredible 11,000km migratory flight from Alaska. Many of our kayakers have had to endure long flights across the Pacific to get here; spare a thought for these wee guys – they lose almost half their body weight on this flight alone. Makes you think of airline food more sympathetically now. Godwits will spend the summer here feeding up, identifiable on the lagoon by their slightly upturned long probing beaks. Early summer is also a really active time for forest birds feeding on the abundant flowering flax and kowhai that lines the lagoon edge. 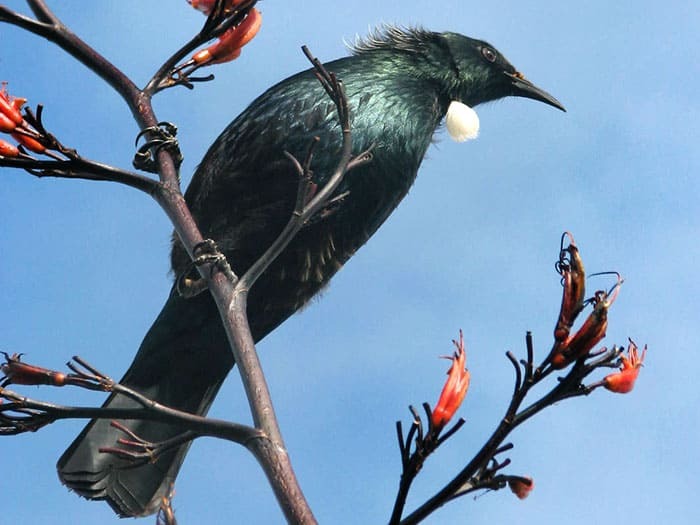 Calls from Tui and Bellbird dominate, but you can also hear and occasionally see a host of Warblers, Robin, Cuckoo, Tomtit and Australasian Kingfisher’s out there. There’s the chance of seeing a Falcon dive across the forest edges, or hear the chaos of a post-lunch semi-inebriated Keruru falling through the spindly twigs of the kowhai tree it ill-advisedly chose to rest and feed on. Keruru’s understanding of basic physics is limited, and these puffed-up pigeon’s still don’t seem to understand that tiny tree branches might not support the weight of their over-sized torso. Still, that’s probably good thing, as Keruru probably wouldn’t even try to fly if they had seriously studied aerodynamics and weight-to-wing ratios. There are local conservation projects in and around the lagoon to study and protect populations of elusive Bittern, and the long running Operation Nest Egg has had tremendous success in recent years in growing the critically endangered population of Okarito Brown Kiwi/Rowi that roam our forest here at night. 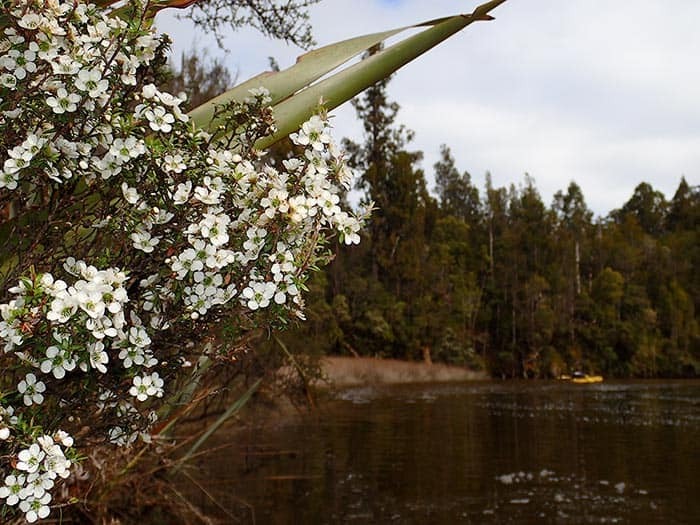 Rowi have been found curiously poking around the tents of overnight kayakers in the summer just gone, and their survival in the Okarito forests are testament to some incredible work that has been done in the last ten years by DoC. The lagoon and it’s waterways are different on every visit, and time of day and season, water height and salinity, and even your own explorations and interest-level provide for an incredible array of bird-watching opportunities out there. We take the time to go through a briefing on some of the species you’re likely to see out there day to day, but will also provide you with a bird identification guide and dry-bags for your camera and binoculars if you choose to take them along. 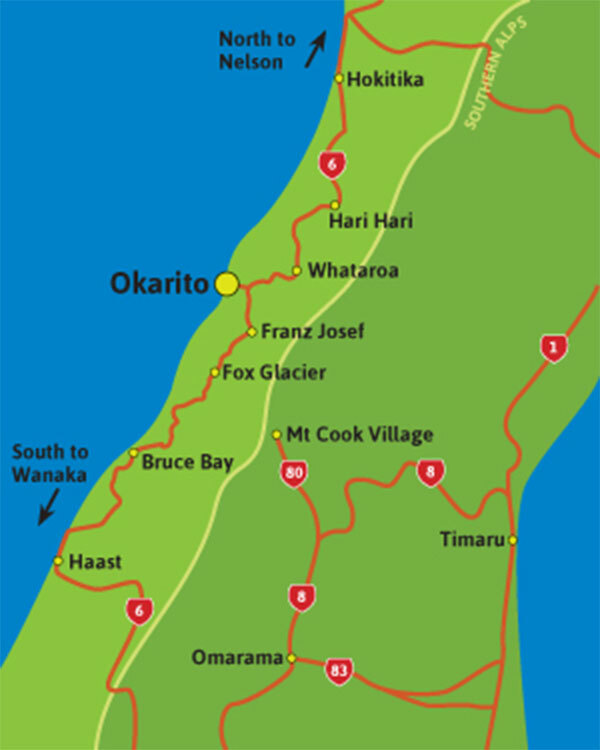 Okarito Lagoon is New Zealand’s largest unmodified coastal wetland, some 10 km or 6 miles in length, and offers expansive views across the full panorama of Westland Tai Poutini National Park – from the Tasman Sea right up to the peaks of our highest glacier covered mountains. A clear day offers magnificent views of Mt Cook/Aoraki, the Franz Josef Glacier neve and the tallest peaks of the Southern Alps/Ka Tiritiri O Te Moana, stretching across the horizon. 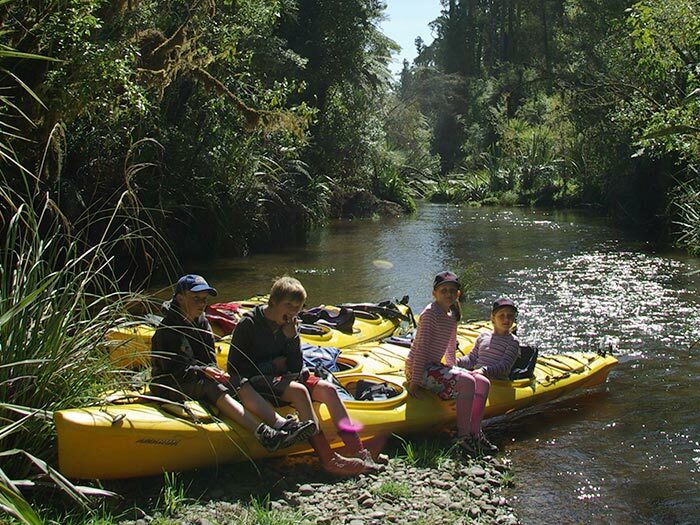 The open views of the lagoon allow access to beautiful secluded tannin-soaked waterways, dominated by 700 year old Kahikatea and Rimu trees towering above you as you paddle further into the lush podocarp forest. 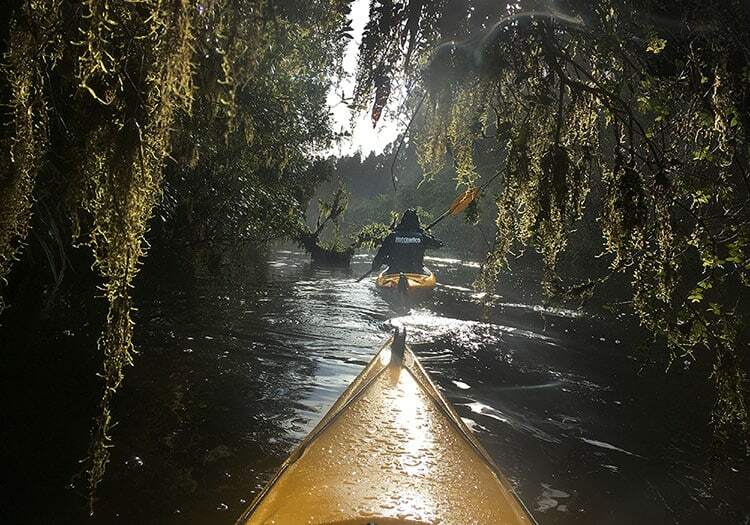 It’s like paddling into a lost world. 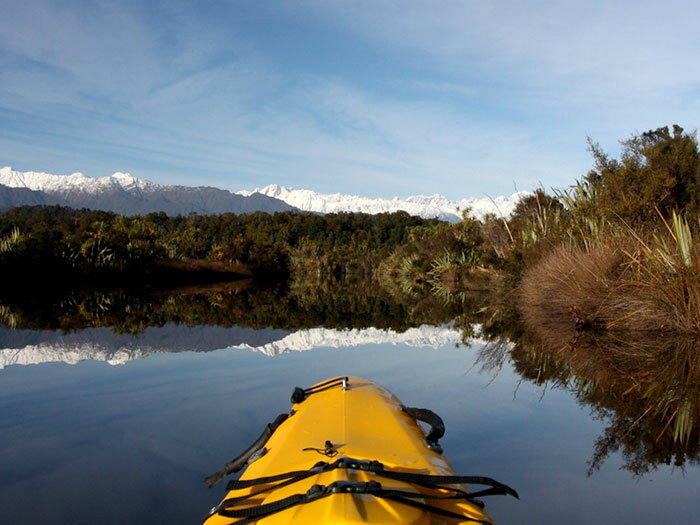 Many of the plant and bird species here are unique to New Zealand, and it’s just you and your kayak to explore them. The Lagoon and its surrounds marks the northern edge of Te Wahipounamu, the UNESCO designated South West New Zealand World Heritage Area. This is the most special place in New Zealand. What is the best time of year to kayak? That’s a tough one! Summer (December to February) is of course the warmest and driest time of the year, and the later into the summer we go, the more stable and calm the weather. We often have some wind through December in the afternoons, but have some great sheltered waterways to use to as options to explore. Autumn (March to May) is most likely to have clear calm days with glassy water surfaces. Again, there’s less rain through autumn, and still plenty of daylight to enjoy. Spring (September to November) is our wildest time of the year – some great weather, some heavy rain days. Morning kayaking is often best as wind picks up in the afternoon, but again, we have some secluded waterways we use for sheltered kayaking if the wind picks up. Great time of year for birds out on the lagoon. What time do your guided trips go? When you want! We customise guided trips to you, rather than run trips for big groups that don’t know each other. Our guided trips run with a minimum of two adults, and we’ll advise on the best tides and conditions for you to get the most out of your trip and with the time you have available. We don’t cancel kayak trips for light rain or showers; the lagoon is still beautiful to go paddling in with light rain and remember, its only water – you shower each night! If weather conditions are unsafe for kayaking, we will let you know and cancel at no charge to you. Good question! Yes, tides influence the height of water in the lagoon, and the direction the water flows, in or out of the lagoon. 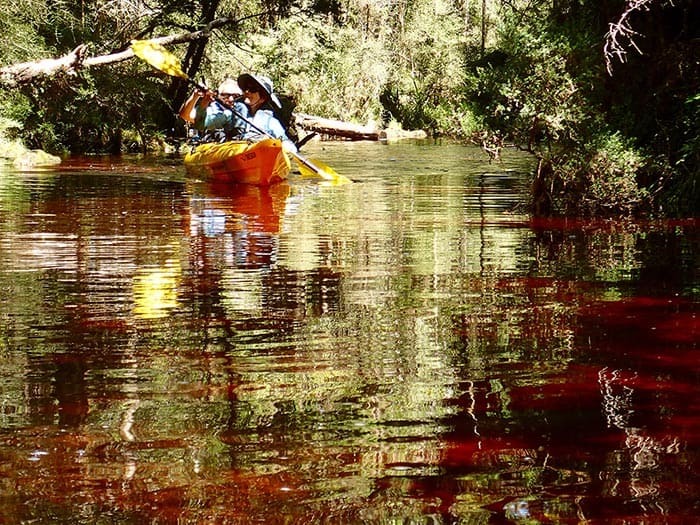 The tide will play a big part in how easy your kayak trip is, and where you can get to easily in the shallow waters and rivers. Just give us a call to ask about tides on any day, and we’ll suggest the best times to go kayaking depending on tides and weather for you to get the most out of your visit. Don’t pay any attention to published coastal tides, as the lagoon tides work quite differently depending on recent rainfall, moon phases, lagoon mouth condition and your coffee intake! 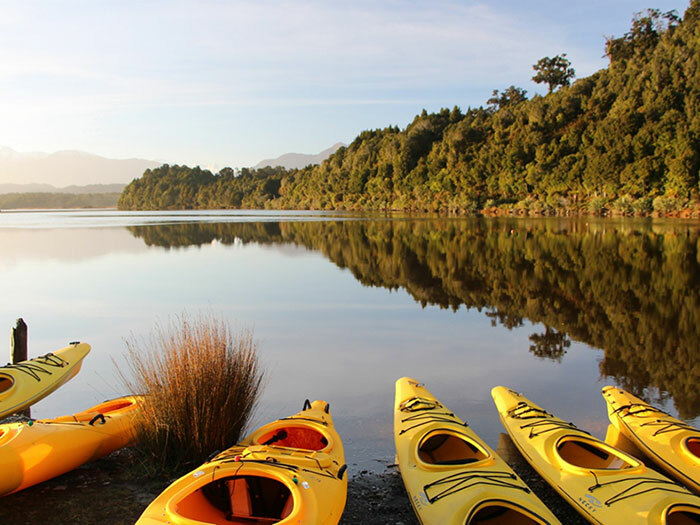 If you’re bringing your own kayak here to Okarito to explore, pop in and say hi; whenever we have time, we’ll happily talk to you about where we like exploring, tides and weather for the lagoon, and we usually have a spare map we can lend you if you’d like to borrow one. That depends a lot on your kayaking technique! We’ll help you with that, and go through a full safety briefing with you before you kayak. We work through some paddling technique before fitting you to your kayak, explaining how everything works and launching you onto the lagoon with dry feet. We monitor weather and conditions very closely before and during your time on the water to make sure you will be comfortable out there. We always have a safety boat on standby for us to come and check on you if conditions change, and help you if needed. Wearing quick-drying clothing of the type you would go hiking in helps, as does bringing a good waterproof jacket, but we will provide you with a buoyancy aid to wear at all times on the water, and a sprayskirt (if you would like) to help keep your lower body dry. Capsizing our kayaks is extremely rare; we use super-stable sea-going double or single kayaks, designed for use on open rolling water – but our lagoon is usually really calm, and much flatter than the open sea. We don’t kayak at all on the sea, just the lagoon and flat water rivers. Most (about 95%) of the lagoon is less than 1 metre deep, and you are never more than 10 metres away from somewhere you could stand up on the ground if you needed to. 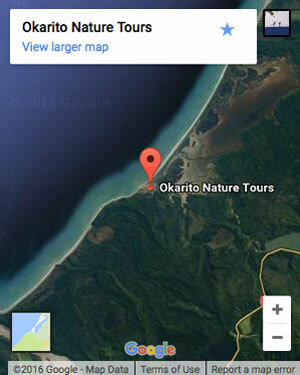 We’re lucky in that Okarito Lagoon is a great place for novice kayakers to get out on the water and explore. When the tidal conditions are right, the tidal flow of the lagoon helps your kayak drift up and down the waterways, and fitness is not a big issue. But, remember, you are self-powered! Some effort is still involved. 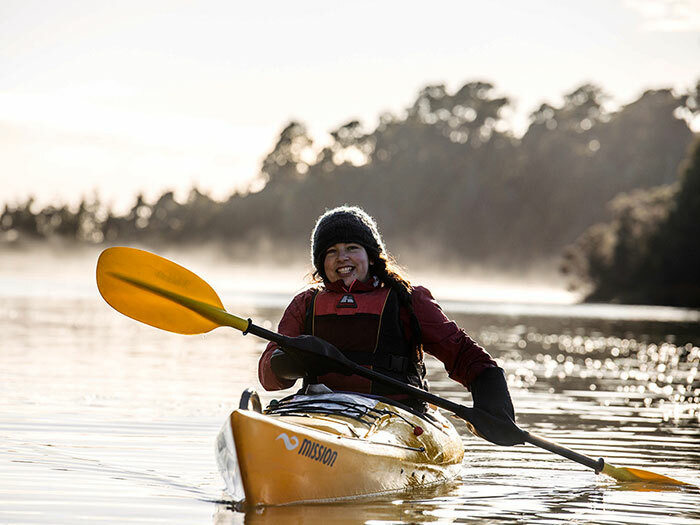 We’ll happily advise on the best route and time for each day’s kayaking depending on those conditions and your own strength and interests, and offer guided trips to those who might be less confident on the water or might want additional assistance. Of course, it helps when Gemma’s made some pretty tempting Carrot Cake or Frittata available at the kayak shop to motivate you to paddle home. We’d ask that if you wish to cancel for some reason – a change in plan or your itinerary maybe – you give us 48 hours notice, and we’ll cancel at no charge to you. Within 48 hours, we would expect to charge for the kayak trip as in the busier days of summer we may well have held the kayak just for you. We generally don’t cancel kayak trips for light rain or showers; the lagoon is still beautiful to go paddling in with light rain and remember, its only water – you stand under more water in the shower each night! In heavy or persistent rain, or if conditions are unsafe, we’ll cancel at no charge to you. 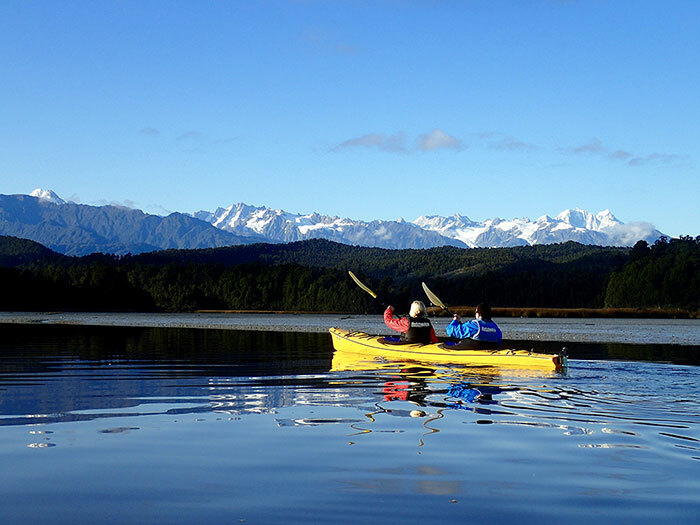 If you’re worried about weather, give us a call the day before you’re supposed to go kayaking and we’ll give you an honest update of what we expect the weather to do – remember, it’s often much better weather out here in Okarito than it is in Franz Josef or elsewhere on the West Coast! We accept cash, EFTPOS, Visa or MasterCard. If you have none of these, we make you our kayak slave. You may want to stay anyway. Well, not bad, not at all, and this isn’t Australia! Sandlfies are a fact of life in NZ – for those of you who don’t know what they are, sandflies are basically a small blackfly, with an annoying, but not dangerous bite. Of course, it’s just the girls that bite. The guys really just don’t do anything. Most days, sandflies are not a problem here on land, and they are very rarely a problem at all on the water when kayaking. Sandflies are really not much good at flying or landing on you when you’re moving even slightly, and also can’t really cope in any sort of wind or breeze, or bright sun. Which we get both more often than not when kayaking. The days that you do come across sandflies, in most places, are overcast, still days, before rain. So, if you’re worried about sandlfies or have already had a special welcome committee from them here in NZ, let us know when you arrive and we’ll make sure there’s repellant for you, if there’s not some already out. And of course, it’s for sale to take some with you when you leave, or can be bought here http://www.okaritosandflyrepellent.co.nz/ or elsewhere in shops around the country where it just might be needed. And the crocodiles have stayed in Australia, our West Island. Better that way.